"Jesus is on his way to Jerusalem. He passes through the town of Jericho. By this time, Jesus is quite well known, and he attracts big crowds. So if you want to catch a glimpse of this celebrity, it helps to be tall. You can look over people’s heads and see things more easily. But tough luck if you’re short. All you can see is the backs of other people. And, as you all know, this Zacchaeus was a wee little man. His “stature of limitations” is causing him problems. If he wants to see Jesus from ground level, it’s going to be a short story indeed. So, he’s a clever guy, and he comes up with a solution. He climbs up in the aforementioned sycamore tree to get a better look. Which he does. But being perched up there also gives Jesus a better look at Zacchaeus. “Zacchaeus, hurry and come down, for I must stay at your house today.” Or, to put it more colloquially: “Yo, Zacchaeus! Come on down from there! Let’s talk! Guess who’s coming to dinner? I am!” Jesus basically invites himself over. 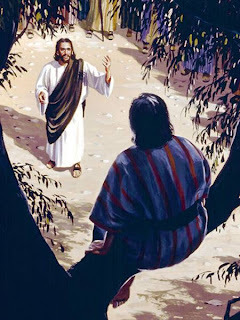 Zacchaeus, you wanted to see Jesus? Well, you got your wish. Here’s the problem. Zacchaeus was a tax collector. Now none of us here probably enjoys paying taxes, so a tax collector generally isn’t a real popular fellow anyway. But in those days, in that culture, the tax collectors had a most unsavory reputation. For one thing, they were working for the enemy, the hated Roman occupying force. But beyond that, the tax collectors had a fairly well deserved reputation for being dishonest, for overcharging, for skimming money off the top to line their own pockets. So besides being looked down upon, literally, for being short, Zacchaeus also was looked down upon for being a crook, for being a tax collector, for being a notorious sinner. And a good religious teacher like Jesus–he ought not to hang out with a guy like that! But he does. Jesus likes to hang out with sinners. It’s his opportunity to call them back home to God, to call them to repentance and faith–faith in him, the Savior of sinners. So Jesus invites himself over. He must go to Zacchaeus’s house today. And Zacchaeus “receives him joyfully,” our text says. Zacchaeus is happy to see Jesus, up close and personal, not just from up in a tree. What causes this joy of Zacchaeus? Why does he receive Jesus so joyfully? It’s evident that it’s because Jesus comes bringing forgiveness into that house. That’s just what Zacchaeus needs. It’s what we all need, really, only sometimes people don’t realize their need for forgiveness. But, thank God, Zacchaeus does. Zacchaeus apparently had been a typical tax collector of that time, ripping people off, making himself rich by cheating people. But now he says: “Behold, Lord, the half of my goods I give to the poor. And if I have defrauded anyone of anything, I restore it fourfold.” Christ’s coming to him has caused a big change in the little man. This is repentance happening here. Zacchaeus has come to grips with his sins, he’s acknowledged them and is turning away from them. Jesus has that effect on people. Even though repentance in this case may end up costing Zacchaeus a bundle of money, he’s glad to part with any ill-gotten gain and also to repurpose his wealth to help the poor. But that’s OK. What Zacchaeus is receiving from Jesus is worth far more than all the money in the world, and Jesus is giving it to him free of charge. Forgiveness, salvation–tax-free? Such a deal! The joy of Zacchaeus is the joy of repentance. It’s the joy of finding forgiveness in Christ for all your sins. It’s the joy of finally being found, when you have been lost, lost in your own messed-up life of sin. 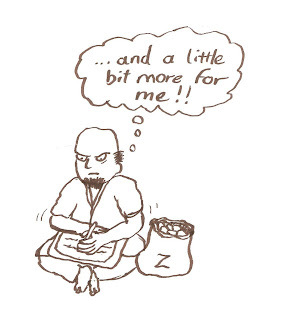 Zacchaeus realized his need for forgiveness. And you do, too, don’t you? You know that line from the song, “Zacchaeus was a wee little man”–“wee,” as in “w-e-e”? Well, tonight let’s rephrase that and make it “Zacchaeus was a ‘we’ little man”–“we,” as in “w-e.” For Zacchaeus was a lot like “we” are, you and I. He was a sinner weighed down with a load of guilt. Just like we are. Zacchaeus was a little man who did the little things, the shady things, to work to his own advantage. Just like we do. Maybe fudging on the figures just a bit. I’m sure that in the ledger book of sins, God could find sins that we do that are in the same bracket as those of Zacchaeus. Zacchaeus was a “we” little man in more ways than one. Our Lord told Zacchaeus, “Today salvation has come to this house.” Salvation comes where Jesus goes. Now today, this day, Jesus has come to this house, this house full of sinners right here. Salvation is here, because our Savior is here. And, like Zacchaeus, we receive him joyfully! The joy of Zacchaeus is our joy, too. For Zacchaeus truly was a “we” little man with a great big Savior.